Dr. Rowena M. Libo-on (fifth from right) has made initiatives for CPU to partner with numerous universities around the globe. Students of CPU Iloilo City and CPU Extension Schools abroad, Myanmar, Vietnam and Japan, among others, are highly satisfied with the quality of education that CPU Graduate School provides. Dean of Graduate Studies and Director of the Office for Transnational Programs, Dr. Rowena M. Libo-on, announced this good news in a recent interview in CPU TV’s public affairs program, Looking Forward. 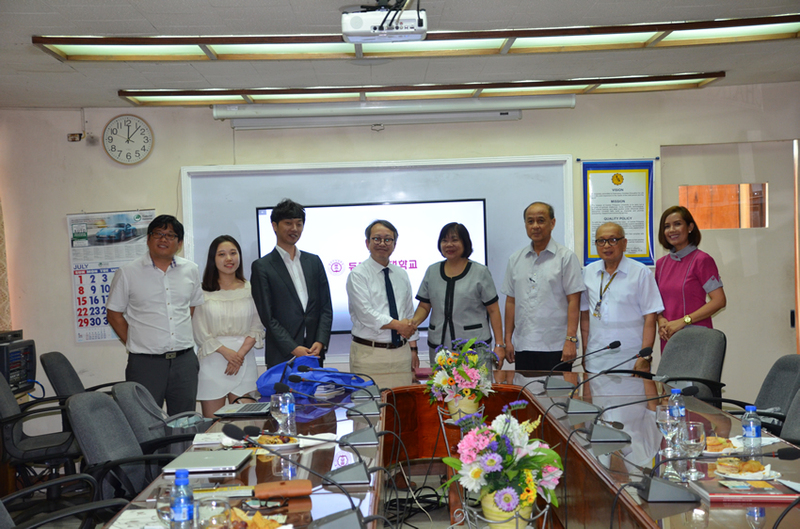 Moreover, government agencies like the Ministry of Education and Training in Vietnam (MOET) recognizes the quality educational programs that Central Philippine University extends to their country. It is likewise satisfied with the relationship of their students and the well qualified Filipino teachers that CPU sends to their universities. CPU’s transnational programs and scholarship exchanges, according to Dr. Libo-on, is well-coordinated with the Commission on Higher Education at the Philippine Embassy in Vietnam and with the Office of the Vice President for Academic Affairs in CPU. The program provides good exposure for CPU teachers in other countries. CPU President, Dr. Teodoro C. Robles, was particularly mentioned by Dr. Libo-on as very supportive of the transnational programs.